Originally built in 1882, The Cincinnatian is listed on the National Register of Historic Places and remains the only small luxury hotel in the city. The facility had not seen any major work since 1986, and was in need of updating. Stanton Millworks was selected to create a vast portfolio of custom shelving, restaurant elements, and a stunning feature wall in the lobby, all as part of extensive renovations to the hotel as it becomes Ohio’s first Curio Collection by Hilton Hotel. The project involved updating the public spaces on the first and second floors. The end result is a modern, sophisticated hotel with unique, high-end finishes. A new restaurant and bar, Brick + Mortar, was added to the front corner of the building, more accessible to the general public. The American-style gastropub has a casual and cozy environment with dark wood and exposed brick. Stanton Millworks created the host station and the main bar. A second eatery offers a market-like atmosphere for hungry people on the go, and features custom shelving from Stanton Millworks. The main doorway between the restaurant and the hotel, on a barn-door sliding frame, is also a Stanton Millworks creation. 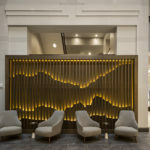 The biggest assignment was the feature wall on display in the lobby, a stunning work paying homage to Cincinnati’s hills. Made from all Red Oak material, solid and veneer. The vertical slats are miter-folded veneer plywood. Plywood was required to maintain straightness, as solid lumber could eventually warp. For this artistic work it was critical that the slats remain straight. The slats are also semi-removable, to allow access to the LED lighting. The slats are grouped into four sections that can be lifted and then pulled out from the frame. The lighting consists of simple LED tape mounted to a recessed substrate that follows the contours of the hills. Each layer consists of five panels that were shaped on our CNC router and jointed in the field. The details incorporated to refresh this historic icon not only match the new brand, but pay homage to the building’s history and the city’s.